The term used to be "New Jersey Justice of The Peace", however New Jersey did away with that title. The title most commonly used today is "New Jersey Wedding Officiant", "New Jersey Wedding Minister" or "New Jersey Wedding Celebrant". 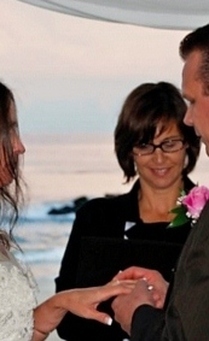 non-religious and interfaith personalized wedding officiant services and am honored to work with couples of all faiths, traditions and lifestyles. I have a selection of ceremony packages for you to choose from.They range in length and price so there is something for everyone. If you are planning a wedding in New Jersey, be sure to check out my Packages/Pricing. I have put together some beautiful ceremonies for you to choose from. You may use one of these, or you may select from a collection of Ceremony Elements that I have gathered. If you would like, I will work with you to create a more personalized and unique ceremony. For a description of each element in a ceremony and to read my ceremonies please go to the Ceremonies page. To choose from a collection of ceremony elements that I have gathered please see Build Your Ceremony page for a menu that allows you to create your own ceremony based on your preferences. For those looking to avoid the stress and expense of a large wedding, I have designed a Seaside Ceremony for your beach wedding at the Jersey Shore. This is a simple yet beautiful ceremony package that takes the stress and expense out of a big wedding. For complete description and prices please see the Seaside Package page. For more information or to book my services fill out my contact form, or email me at thisjoyous@gmail.com.